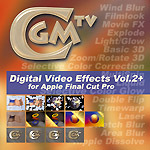 The "CGM DVE Vol.2+" is a set of 33 filters and transitions for use in Final Cut Pro and Final Cut Express. In addition to the professional plug-ins, the package also includes a series of Final Cut Pro workshops and 68 softwipe patterns. Have you ever searched for a filmlook for Final Cut Pro? Stop searching and don`t waste money because here it is! The CGM Film simulates 35 mm film and aged film (shake, jump, scratches, dirt, hair, gamma, brightness flicker, ...). ceremonious touch to your movies. Take a look at the edges of our Ripple Dissolve. We won`t see have any black holes. With Basic 3D you can reproduce a rostrum camera movement, a camera that can move over and zoom into large images like maps. a specific area of the film.